It is every scholar’s task to adopt a way in which to communicate with, help and teach students in their classroom. This article has some suggestions as to how to build one’s teaching persona, the way they will behave in the role of the teacher. 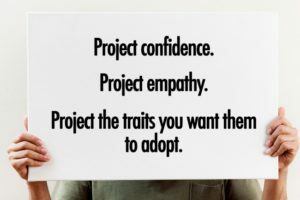 The writer suggests scholars to project confidence, empathy and the traits they want the students to adopt, adding that it is much easier to change what you do in class as a teacher than changing who you are as a person.